Alright I'm really getting ahead of myself, but I just couldn't resist making a Valentine's Day card with my sweet little sheep. Of course, the inside will say "to ewe." I'm tell ing you I think I really can make these "lambs for all seasons" or should it be "sheep for all seasons"? Anyway Christmas lambs are in the works as I write and I'm thinking Easter is a given! After all, if we're going to have lambs we must relate them to the Lamb of God. This is a good start as we think of His great love for us. I think I should put a scripture inside each card too. Keep checking back, I just know more sheep will be appering soon. I am obsessed! 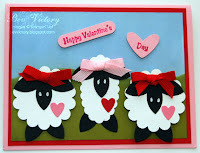 I hope that you will give these sheep a try - they're easy and sooooo much fun. Enjoy! This is the most fun I ever had making a card. I discovered the lamb made with the scallop circle and then I thought why not make one with the scallop oval! Well, this is a make you happy kind of card. The feet and face/ears are made with one 5 petal flower punch and basic black paper. The lamb bodies are Whisper White, the bows are More Mustard and Tempting Turquoise. I used my brayer for the back ground old olive on the bottom and a combination of Pacific Point and Bashful Blue - because I don't really have great skill at the "brayer thing" I have some overlapping, but I thought it kind of looked like hills so I left it. LOL The real reason is I knew the next one wouldn't be any better so just see it as hills! I used a combination of All in the Family Phrases ( I like) and Farm Fever - retired (EWE.) If I make this in club or a class I will use an alpha set for the EWE, but last night this is how I did it. 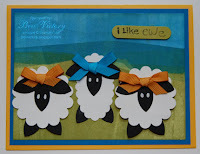 I took this card to my upline tonight - she collects lambs/sheep - it was the perfect card for her. I had so much fun making this card that I have some plans for more - a theme of "lambs for all all seasons" - keep checking back you never know when another one will appear! Get out your punches and start making fun cards - if you need punches give me a call and we'll get them ordered. Last night was Christmas Card Challenge at my house. Only four of us were in attendance - one had a husband in need and one was in Arkansas, but the remaining four of us worked like wild women and got our cards made for the month! Mine was CASED from Jill S. (at this time that's all I know - further links etc. will follow when available). Anyway, I haven't decided yet the sentiment on the inside of the card, but I love the front! The stop sign is from the stamp set - It's a Sign, pg. 138, $30.95 in the current catalog. I used Shimmery White Paper and you can't see it in the picture, but it gives quite a sparkle to the snow and the night sky. I stamped the stop signs in real red and then decided I wanted them embossed, so I covered them with my VersaMark pen and clear embossing powder. The moon is brushed silver. Punches for this card are: 1 1/4" square (chimney) 1 1/4" circle (moon) 5 petal flower (Santa legs) Horizontal Slot (boots/feet) Scallop Square - modification (snow on chimney), bricks were drawn with gel pen, sign post cut free hand. Making this card was so much fun - punching out all of the parts and then assembling them. The night sky was done with Pacific Point stamp pad and my trusty brayer! Give this card a try it's fun, fun, fun. Can't wait to see what I choose for next month - it will have to be good to top this one. Thanks Jill S. for your talent and your sharing! If you haven't started your Christmas - now is a good time to start - December will be so much more fun if all you have to do is address them! Now on to my post. Two stamp sets have recently become two of my favorites. Bloomin' Beautiful and Embrace Life are both used for the flowers on this card. Beautiful Borders was used along the left side to add some interest. The bee was printed on WC paper and cut out, I cut around the antenae, but not the legs! LOL Both of these sets are available in the current catalog. The "thank you" is from Short & Sweet, a very economical, but versaitle stamp set. I used Regal Rose and Always Artichoke markers to stamp the flowers and filled in with Pretty in Pink and Certainly Celery with my aqua painter. The water washes out some of the lines and gives it a real watercolor look. I love tearing paper and WC paper tears so well and then a simple roll at the top to give dimension. Dampen the corner of the paper before you roll and it's so much easier and dries into a tight roll. The card is Pretty in Pink with Kiwi Kiss as the second layer. Always Artichoke is used for the sentiment. Easy and elegant - Enjoy! Have a great Memorial Day and see you again soon! This Tour is Over But There Will be Another One in July! I hope you enjoyed the Blog Tour. The links are gone for this tour, so I hope you bookmarked all your favorites. Our next tour will be July 27 and 28.It will coincide with the launch of our yearly catalog, so be sure to stop back here in July for updates! 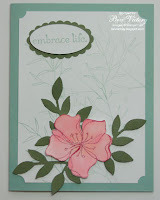 For the May tour my projects featured the stamp set "Embrace Life." which can be found on page 93 in the Idea Book and is $25.95. My first project is a 6 x6 scrapbook page. 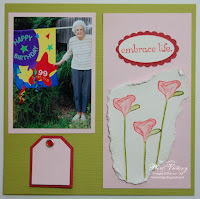 I chose In Color textured papers for the base and a picture of my mom celebrating her 99th birthday - what could fit "Embrace Life." more than her 99 years. I haven't added the journaling yet, but I used our small and large tag punch for future writing. The flowers were stamped on watercolor paper using markers so I could get the two colors and then using my aqua painter I softened the lines and added a little pretty in pink to the petals. The outline is regal rose and again I softened the lines with the aqua brush. For a 6x6 I got in a lot of goodies! Everything used is available in the current Idea Book & Catalog. My second project is a card and it's actually pretty simple. I did use the Big Shot an d the Little Leaves sizzlet, but only two layers of paper, Mellow Moss and Whisper White. 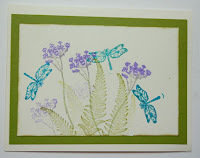 I used the leaves stamp from the Embrace Life set to do the background on the whisper white paper. I inked the stamp, stamped it off on scrap paper to lighten the shade. I used shimmery white paper for the flower and watercolored the flower using Pretty in Pink reinker and my aqua brush. 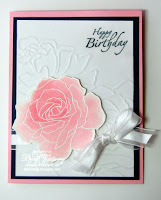 I used Rose Red Craft Ink and embossed the flower with clear embossing powder. The leaves and the scallop oval are Always Artichoke. The ticket corner punch was the final touch. I think this is a fun and elegant card, but very easy to make. 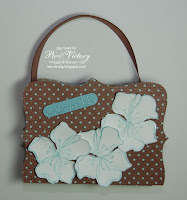 My last project is an adorable Top Note Tote decorated with the single flower stamp from "Embrace Life" . 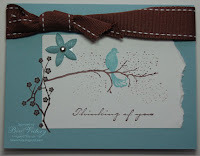 I used the Parisian Breeze specialty Designer Series paper (DSP) which is a textured, cover weight card stock . It is double sided like the other DSP papers and compliments Baja Breeze, Chocolate Chip and Kraft papers and embellishments. I used Whisper White for my flowers. Embossed them with Baja Breeze, VersaMark and clear embossing powder. I spritzed them with water, let it soak in and then dry to change the texture of the paper and allow me to curl the edges for dimension. The front and back are the top note die and the box is made with the Sizzix box #2. Normally I would cut off the top and the side flaps, but because of the great paper, I folded the flaps down, put my ribbon on the inside and a rhinestone brad - Square Ice on the outside. I've given pictures of the end with the rhinestone, inside so you can see how the bottom looks inside and the bottom so you see the finished look. This box is awesome - it folds together and uses one small piece of adhesive to hold it together. These make wonderful little gift bags - almost as important to the recipent as the gift inside! LOL Actually they are perfect for a gift card, a small piece of jewelry or the best gift of all a rubber stamp! Tour 7 - Stop 12 - "Embrace Life"
Tour begins May 15 and lasts for two days only! Bookmark this page for easy access to the tour! Preparing for the May 15-16 Blog Tour! Sorry, I've fallen off the everyday blog wagon! You will find me back up and running on Friday with the Blog Tour! Right now I'm working on those wonderful new projects that will be featured on Friday and Saturday on the tour. Be sure to check the information on the right sidebar and bookmark this page so you can jump on the tour early Friday! See you in a couple of days - remember you can shop 24/7 on my website www.bevvictory.com. This easy link will take you right to my Stampin' Up! website. Wow, what a day! Some days just have too many things to be done and too few hours, and this was one of those days. I got up early so I could do the Chat & Challenge on SUDSOL (Stampin' Up Demos On Line) and as always had a blast. Today we had demos from Ohio, Alaska and Tx - and it was fun talking about our weather and what we consider nice. Guess who was having the warmest day!! I won that won easily. LOL This is the card I made today. It didn't really meet all of the challenge rules, but I really like the card. I really like challenges too - they make me think and do something original. I used Bloomin' Beautiful and Embrace Life flowers - look good together don't they? I'm also excited because my birthday/mother's day present arrived today and Bill let me have it tonight! He got me a notebook (computer) so I'll soon be totally wireless and can work anywhere! Yea! I don't have time to do anything with it this week - tomorrow night is stamp club, Thursday afternoon is another stamp club and the Blog Tour starts Friday 5/15 - so I'm working furiously on my blogs for Friday and Saturday's tour. Looks like my birthday (Friday) will be the day I get to play with my new toy! So for tonight, I'm heading back to the work table and finish my projects! Pull out some paper, some stamps, some ink and, of course, some embellishments and get to work! You'll be gald you did. See you tomorrow! Happy Mother's Day to all! I hope you're having a wonderful day. I went out of town for a couple of days, but drove back in early today to spend it with my mom. Many of you know she celebrated her 99th birthday on 4/27 so each day is a special gift for us both. I didn't want to miss going to church with her and letting her know how special she is to me. 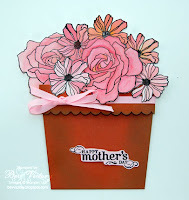 If you've been keeping up with my blog you know I did a flower pot card for her with die cut flowers, but it's been fondled to the point of no return! Everyone wanted to see it, touch it, pull out the card etc. so I thought she deserved a new one - so here it is. Don't you love this verse? I can't think of anything better than finding that I'm turning into my mother. Wow surprised you didn't I? You weren't expecting watercolor roses were you? LOL Yes, one more flower pot card and more watercolored roses and flowers from the Fifth Avenue Floral set (pg. 106 - $24.95). Ok, I am obsessed with this stamp set and this technique. I tried another color for the embossing - black this time - and I like it. Hope you do to! Hope your day is blessed and look forward to seeing you tomorrow! I promise it won't be a rose really, I promise! All in the family goes pink! This morning I walked in the Komen Race for the Cure, Tyler, TX with my dear friend Deb. This time last year she was recovering from the radiation treatments and didn't feel like doing the walk - this year we're doing it together. Survivor and friend! This trip to Tyler and the walk reminded me of the thank you cards I did for donors for my Avon 39 mile walk last year! I used the All in the Family set (pg. 77 - $38.95) to make my ladies in pink. 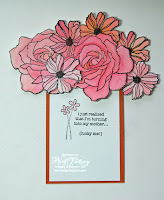 The ribbon stamp on the top isn't Stampin' Up!, but for this purpose I needed it and I don't think Shelli would mind! This is such a versatile set - as you can see it can be adapted to any cause, celebration, family event, etc. When you add in the two accessory sets and the family phrases you can make cards forever and never run out of new layouts. I hope you enjoy this card and use it to remember to get your mammogram! Hug your lady friends and remind them that a woman is diagnosed with breast cancer in this country every 3 minutes! Early detection saves lives - Make a card for a friend and use it as a reminder! See you tomorrow for Mother's Day! Like everyone else who has discovered watercolor roses, I just can't stop making them! We will be doing this card at our club on Tuesday night and Thursday afternoon! I hope I don't ruin the surprise, but I think everyone will just be excited. I used Three Little Words (pg. 136 - $13.95) for this card. You just don't realize how many "three little words" there are - so I'm going to tell you what's in this set. I miss you, you you you, thinking of you, I love you, so very sorry, thanks so much and of course, the beautiful stamp that actually says Three little words . . . This one set can make so many different cards and there's nothing stopping you from using other word stamps to make your own three little words. I used the embossing folder Manhattan Flower with vellum cardstock and then flipped it over to the debossed side . That allowed me to use the Three little words stamp on the top and still look really good (picture doesn't do it justice) and my watercolor rose! I decided to branch out from the white embossing powder that I've been using and used Rose Red craft ink and clear embossing powder. I really like the way the darker lines pop. I think the ways of doing this are limitless and so you are going to continue to see roses and every other flower I can watercolor this way. Hope this inspires you to think out of the box and try a new color or new technique! I had so much fun today - my friend Konnie came over and we stamped and talked and stamped some more. We haven't had a chance to do this for several weeks and so it was nice to get out our stuff and just work - bouncing ideas off of each other and sharing our lives as we worked on our own projects. I am preparing for the blog tour May 15th & 16th (see side bar for more information) and so obviously I can't show those projects until next week - so Konnie let me photograph one of the cards she did and it is my feature card for today! Interestingly she was using Organic Grace (a hostess set from the Fall Winter Stampin' Up Idea Book & Catalog - one I couldn't wait to get and haven't used at all. I hate when I do that, but I think her cards inspired me to get out my set and use it! I love how she did the dragonflies. Don't know if you're keeping track, but so far I'm keeping up with my daily goal. Keep me honest! Stamp with a friend and find new inspiration - see you tomorrow. Roses - I love roses and I just can't get enough of this watercolor rose technique. I am so thankful that I have this Fifth Avenue Floral stamp set. I hesitated for a long time and I'm so glad I finally got it. 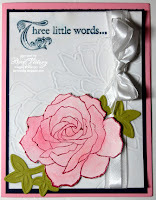 This stamp set and this technique can be used in so many ways to decorate a card. 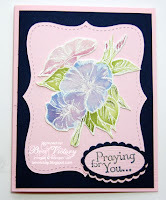 I cased this card from Mary Brown, http://www.stampercamper.com/. The special part of completing this card (yes, it's pink and navy again) is that when I turned around to get my camera I saw a picture that reminded me so much of this rose. 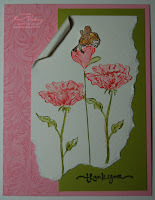 I'm posting both the picture (rose from my friend Deb's garden) and my latest card! I hope you enjoy both - now let nature inspire you to make a card! I love to chat and I love a challenge, so how perfect would a "chat & challenge" be f or me! Someone picks a sketch and I get to pick my paper, my embellies and my stamps and go to work. At the same time we're chatting on line - well I'll be honest I can't do both at exactly the same time. I chat a while, gather my materials, chat a little, work on my layout, chat, work, chat, work and before you know it I'm all done and the time is up. Best of all I've made some new friends and second, I have a new card - finished - ready to mail! Wow, this was designed for me., it is the next best thing to having a friend over to stamp. Here's today's card, I'm sure you see that I'm sort of on a Night of Navy, Pink Pirouette and in this case Pretty in Pink roll this week. I just discovered this color combo and love it - hope you enjoy. Now it's your turn - take this layout/sketch and make a card of your own. You know you pick all the colors, stamps etc. - Make it your own and most of all have fun! 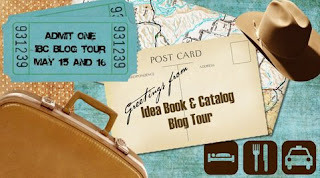 On April 27 there was the most amazing Blog Tours. There were three separate tours of 20 different blogs each! 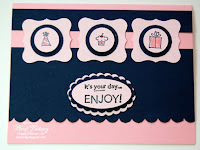 Can you believe it - 60 different Stampin' Up demo's blogs were a part of the tour. I visited every blog and I can't tell you how much I learned and how much I enjoyed seeing what other SU enthusiasts are doing. These tours featured items from the mini occasion catalog and wow what fun! But now, I'm happy to say that I will be a part of the newest tour. As they say April Showers bring May flowers, but if you join us on May 15th and 16th, you'll see more than lovely blooms! Pack your bags 'cause you're going on a trip! Take a tour of 20 beautiful blogs, and you will see creations that will amaze and delight you. But it's only a two-day trip! It begins at 8:00 a.m. EDT on May 15th and ends May 16th at midnight! Some of you know that May 15 is my birthday - but for those of you who don't - let me tell you that this is the best birthday gift ever! I am honored that I've been invited to be a part of this tour and hope that you will check it out on the 15th and 16th. Stay tuned for more details. I can't believe it's already here. I love May - the flowers, the warm days and my birthday! What's not to love about that? My goal for May was (you note I say was) to blog every day - that means not just saying hello, but having a new card, technique, project etc. and posting it before I went to bed - well, it's barely still May 4 and this is my first post of the month! So, I guess my goal is to blog everyday for the rest of May - lol! Hold me to it and we'll see if I really get it done - I'll do my best! It's not that I haven't been stamping - I've been stamping like a fool - trying all sorts of new techniques, but I just have lots of little bits and pieces. Then today I actually began to put some of them together and have two cards to post. The first one really is made from some of the bits - I've been experimenting with watercoloring using reinkers, watercolor crayons, markers and different types of paper. The flowers on this first card is done with watercolor crayons and reinkers on watercolor paper. I then cut the flower out so it becomes more dimensional. You'll see more of the variations as the month progresses. This second card was cased from one we did at Sally Upton's club a number of months ago. I pulled it out of my favorite samples. The orginal used the wide chocolate chip ribbon and had a big knot so I decided Ineeded to change it up for mailing . I chose a layering paper from Parisian Breeze - the dark brown side to make up for the lack of the rubons we originally used, but as I started to add the ribbon and saw the polka dot side of the paper I quicklly flipped it over and changed the entire look. Here is the one I made today on the left and the original that I cased on the right. so you can see how easy it is to take a great idea and change it into your own design. Sometimes a sample is so perfect you don 't want to change a thing, but most of the time you will find that just like me today I didn't have all of the same embellishments and so changes were made and the end result is a totally different card. Now go find some inspiration and make a card - you'll be glad you did!